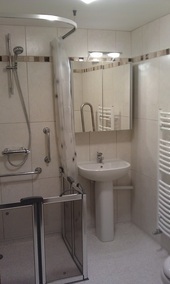 We have experience in planning and installation of disabled bathrooms. When working on this type of project, it is important to focus on what needs the user has and how best to facilitate them. Sometimes we have to be creative in our thinking; working to make a solution work. For example, we created a disabled bathroom in the a corner of a sitting room, it blended in and looked like it had always been there.